Much has been made of the poor performance of small caps relative to large caps this year. The Russell 2000 Index of small cap stocks has underperformed the Russell 1000 Index of large cap stocks by 10.6% (~1060 basis points) on a year-to-date basis through 10/23/14. A significant amount, to be sure, and the year is not yet over. Historically, the average small cap underperformance has been 8.6%. However, while the underperformance of small caps has hurt portfolios with an overweight to the asset class, the underperformance typically occurs in years when the overall market’s performance is positive. 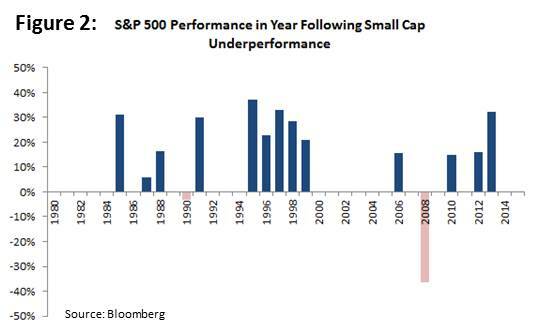 Only once (in 1990) in the past 34 years have small caps underperformed when the S&P 500 declined for the year. More interesting to us is analyzing what happens in the years following the underperformance by small caps. 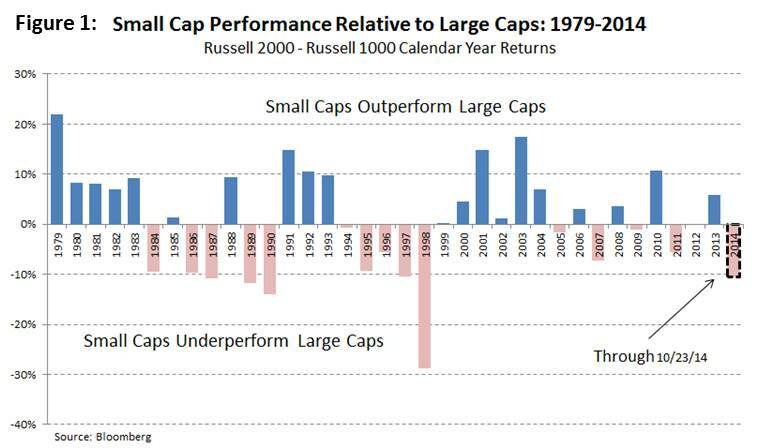 Since 1979, small caps have underperformed 15 times (not including 2014) (Figure 1). In the year following that underperformance, the S&P 500 has risen 13 times, with an average total return of +17.6% (Figure 2). An additional dimension in the analysis is the fact that this is a mid-term election year. 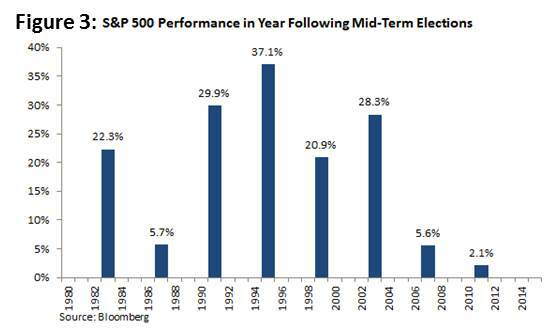 Encouragingly, in the past 34 years, irrespective of the party in power, the S&P 500 has posted a positive return in the year following a mid-term election every time, with an average gain of 19.0% (Figure 3). 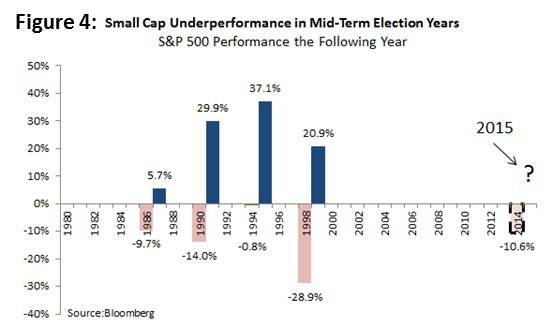 Combining the small cap underperformance and mid-term election year effects, we find that small caps have underperformed in mid-term election years four times since 1979. In each instance, the S&P 500 has risen the following year, generating an average return of 23.4% (Figure 4). While only time will tell what may happen in 2015, history indicates the market could potentially enjoy a favorable year.